Many years ago I attended a seminar by the late motivational speaker Charlie Tremendous Jones. He was engaging. Inspiring. And funny. Very funny. Jones’ mission in life was to help people improve. To develop their potential. And to become the best version of themselves. To become is to change. To grow. Or to develop. It is a constant theme of the Bible. And the essence of what Christianity is all about. In John’s prologue he declared the deity of Jesus, and said that He gave us “the right to become children of God.” The word “right” is often translated “power” or “authority.” By the authority of Christ and the power of the gospel, we can become someone different. We can become a changed person. A new person. A better person. According to Isaac Newton’s first law of motion, “Everything continues in a state of rest unless it is compelled to change by forces impressed upon it.” Well, that is true of people too. If we are to become what we can be and ought to be, something must happen to effect the change. When you read the Bible and meet Jesus, you immediately are challenged to become a different person. He calls us to come to Him. To follow Him. And to be like Him. If Jesus was just a mere man, he would have to be one of the most arrogant men who ever lived. But He was the son of God. The apostle Peter affirms that Jesus was sinless. So, we have been called to follow His example, follow in His steps, and to become like Him. 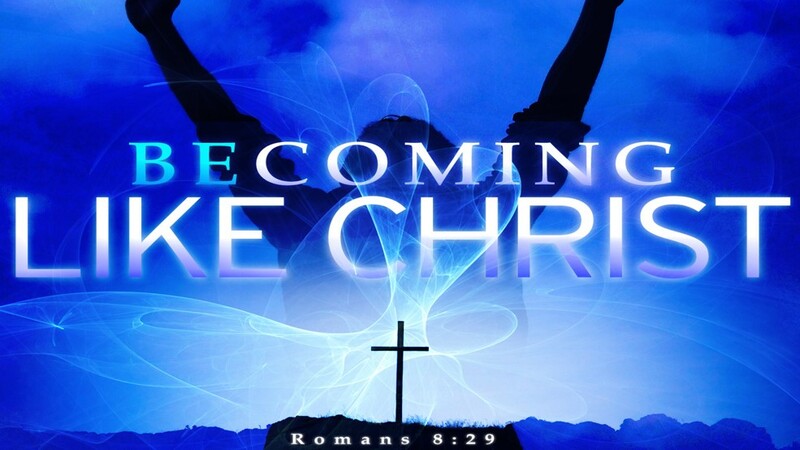 (1 Pet 2:20-23) Becoming like Christ involves a spiritual rebirth through the obedience to the Word of God (1 Pet. 1:22-23). It brings about a change of attitude, character, and behavior. The Bible calls it putting off the old person of sin and putting on the new person of Christ created in righteousness and holiness (Eph 4:17-32). “Therefore, if anyone is in Christ, he is a new creation; old things have passed away; behold, all things have become new” (2Cor 5:17). When we become true disciples of Christ. then we become “children of light” in a sin-darkened world (Jn 12:36). We reflect the light of God’s love. His grace. His mercy. His Truth. His goodness. His kindness. And His compassion. Of course, it is possible to become the opposite of all that is good and godly. When we are shaped by the evil influences around us and conformed to the changing standards of society, we become carnal, worldly and wanton. If we are to become like Christ, our challenge is to constantly feed on that which will nurture our spiritual growth. To associate with people that edify us. To think on things that will ennoble us. And to keep our focus on things above and not on things of the earth (Col. 3:1-2). Who and what are you becoming? Ken, we never met but I’ve been reading your articles since I moved to North Eastern PA (2 years ago), working with and preaching for a small congregation. Your articles have, many times, been an inspiration and encouragement. This one, in particular, is very special to me. I’ve been a Christian for over 40 years and you reminded me I’m still becoming. Thank you for your words.